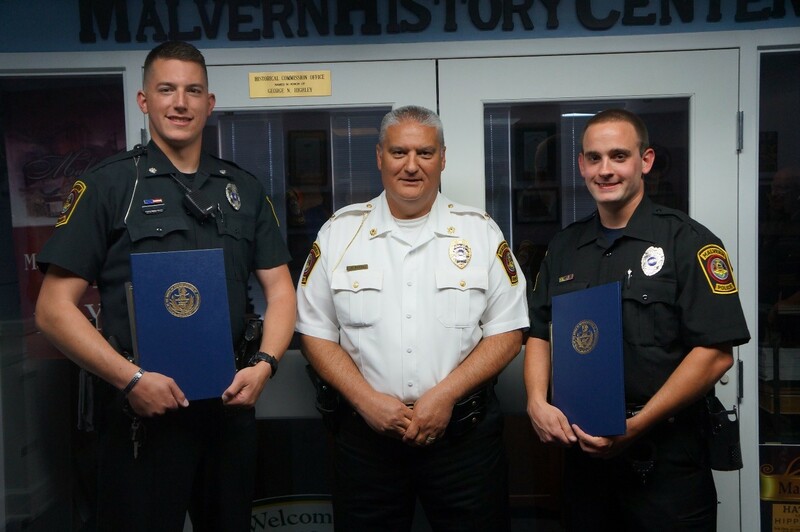 On June 5, 2018, two Malvern Police Officers were recognized for their outstanding efforts while patrolling the Borough. 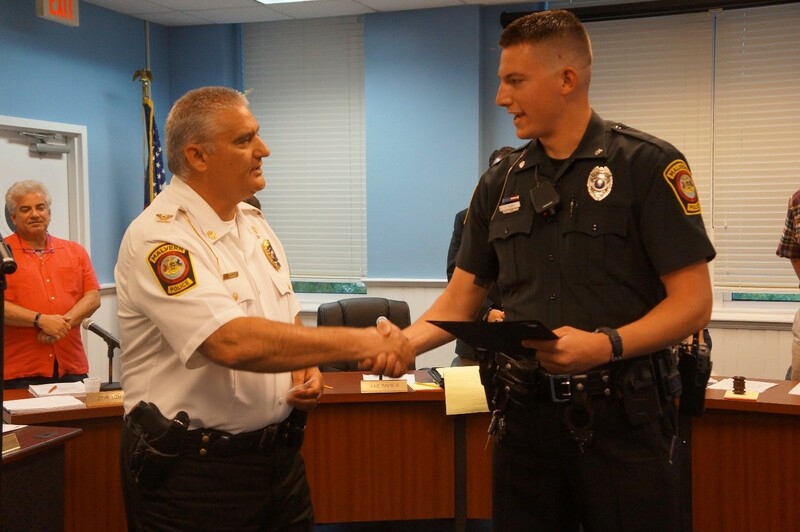 Their recognition are as follow: On Tuesday, May 15, 2018 at approximately 5:00am, Officer Tyler Bury was on patrol. While returning to Malvern Borough after assisting East Whiteland Police Department on a business alarm came across two subjects running across Route 30. Both subjects were running armed with long rifles in hand. Officer Bury ordered both subjects to stop, they continued to flee towards the railroad tracks heading south into the woods. Officer Bury drove to the General Warren Inne where he took a tactical position to see if the subjects would exit the wooded area. Officer Bury saw the subjects, gave chase and captured one of the subjects in the woods. The second subject fled. After several hours this second subject was captured in the Borough of Malvern. The subjects had burglarized Chester County Outdoorsman. While fleeing the area the subjects dropped 25 weapons they had stolen from the business. These weapons were all recovered by assisting Officers. The excellent performance regarding this incident reflects a high degree of competence and professionalism and is in keeping with the highest standards of police work and the Malvern Borough Police Department. Officer Bury’s actions resulted in the apprehension of two burglars and kept 25 semi-automatic weapons from reaching the hands of other criminals. 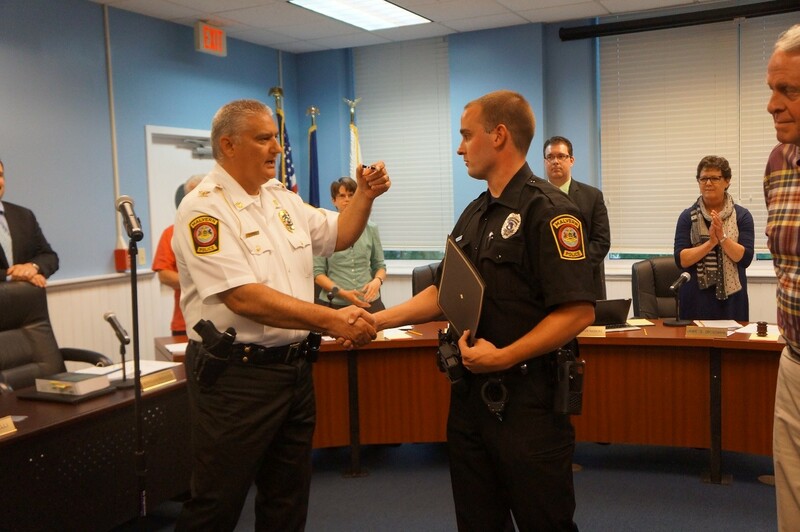 Officer Bury received a Commendation of Merit. On Sunday, May 20, 2018 at 1:34 am, Officer Daniel Sheridan assisted Willistown Police with an emotional disorder. Officer Sheridan arrived and entered the home, where he met the Willistown Officers’ rendering aid to a female who had multiple wounds to the subject’s wrists and neck. Officer Sheridan, who is a trained EMT immediately began life saving treatment to the patient; tending to the wounds to stop the bleeding. Officer Sheridan’s actions were able to slow the bleeding and stabilize the patient until further assistance arrived with better equipment. Officer Sheridan’s outstanding performance in the line of duty, his application, experience and specialized training directly saved this person’s life. Officer Sheridan received a Commendation of Life Saving.